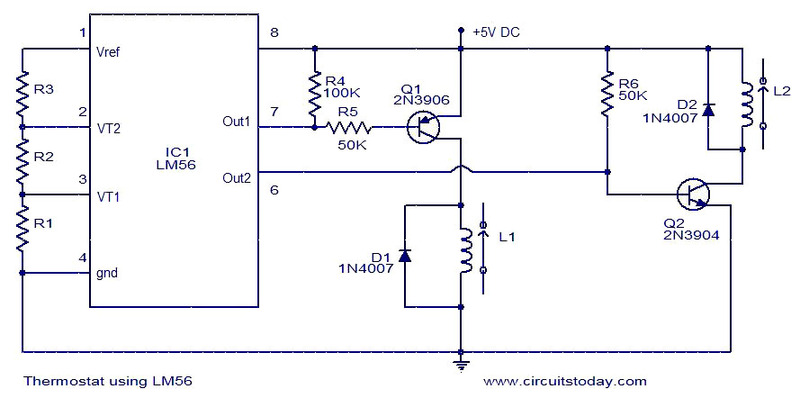 Here is the schematic of a very simple electronic thermostat using IC LM56. LM56 is a very accurate dual output low power thermostat from National Semiconductors.LM56 has various useful features like internal temperature sensor, two internal voltage comparators, internal voltage reference etc. Two stable temperature trip points (VT1 and VT2) are created by dividing the LM56’s 1.250V internal voltage reference using 3 external resistors (R1, R2 and R3). There are two digital outputs for LM56 .Output1 becomes LOW when the temperature increases above T1 and goes HIGH when the temperature decreases below (T1Â±Hysteresis Temperature). In the same way, Output2 becomes LOW when the temperature goes above T2 and goes HIGH when the temperature goes below (T2Â±Hysteresis Temperature). By connecting a cooler as the load for relay L1 and a heater as the load for relay L2, a very simple and useful temperature control system can be constructed. The values of R1, R2 and R3 for the required trip points VT1 and VT2 can be determined using the following equations. L1 and L2 can be 5V relays.Their current ratings must be selected according to the load they switch. Do not give more than 10V to LM56. hello thanks a lot for this project its very useful and i am going to build it but there a question that i cant figure it out . how can i determine the temperature that i want to make control for it and can i make it to heat water .. thanks a lot again and appreciate your effort for helping me .